Structured wiring is a bundle of wire that usually includes RG-6 (coaxial wiring) for multi room video such as Cable TV, and Satellite TV. Structured Wiring also includes Category 5 (or better) communications wiring for Telephone wiring, and Computer Networking. Adding Multi-Room audio is also a popular add-on. Audio systems can be installed using just speaker wire, or a combination of Cat5 and speaker wire. While Running Your Cables - Make sure to Lable each end with a marker or wire lable. Keep track of each run on our Wiring Layout Sheet. This will keep your organized through the entire process. Phone wire distribution should be sent to all rooms that will ever need a phone. Recommended wire is Cat5 or Cat5 E. This wire will allow you to run up to 4 separate lines to each room, or run any advanced KSU Phone system. These wires will all be run back to one central wiring location, for easy changes, and upgrades. Wiring your home for Cable TV, or Satellite TV is done using RG6 Coax cable. By running a coax cable from your structured wiring box, to each room of your home - You are ready for either Cable TV, or Satellite TV. The only thing that will change is the module inside the structured wiring center. Wiring your home for computer networking is an important part of building or renovating a home. Running Cat5 between your structured wiring box, and each room will give you the flexibility of adding computers, or IP addressable devices to your home at any time. In your structured wiring box you will mount your Modem, and your network Router to share internet, and local files between all networked devices. Modem: A device that lets your computer communicate with other computers through a connection to the Internet though a phone line, cable modem, or DSL. A modem modulates outgoing digital signals from a computer to analog signals for transmittal over a conventional telephone line. It demodulates the incoming analog signals into a digital signal for the computer. Router: A router is used to connect , by forwarding information to the proper location. 1 Router is required in your home if you plan to use more than 1 computers or networked devices. While looking for a router, make sure the one you purchase has a built-in firewall. Switch: a switch is a small device that joins multiple computers together at a low-level network protocol layer. Typically in a home network a switch is used to expand a network. For example you can connect multiple networked devices in a room that has only 1 cat 5 cable back to your structured wiring closet. A switch can also expand your network router by adding a simple switch - Which should be plug-and-play. Home audio distributionallows you to listen to music in every room of your home, through in-wall, or in-ceiling speakers. 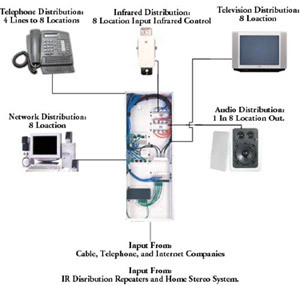 Wiring your home for audio distribution is a fast growing part of structured wiring. This can be done by simply running speaker wire from your structured wiring enclosure to each room volume control, then to each speaker. Another way to wire audio in your home is to install an A-Bus audio system. An A-bus audio system installs using cat5 between your structured wiring enclosure, and each volume control. Then you run speaker wire from the volume control and each speaker. We all need structured wire in our homes and offices. It is the low voltage wiring that streams in your Cable TV, Satellite, Internet, Computer and Phone line connections. In the past, most homes were wired for voice only connections and jacks. Later as America grew into the CableTV market those needs changed. We typically bore a hole through our walls nearest the television set and dangled a partially exposed wire for higher/larger video streams. Today's homeowners need an infrastructure that supports high speed data transmissions. When building or remodeling a home, most builders focus on construction basics such as the foundation, plumbing, and electrical system. Unfortunately, many builders ignore the electronic foundation that supports high-speed voice, video, and data communications. If you’re serious about technology in your home, budget for structured wiring in your next new home or major remodeling project. Pulling the wires during construction is easy to do, relatively inexpensive, and it will not disturb the finished home. Plus, you can roll the cost of structured wiring into the tax-deductible home mortgage. You may find the money you spend on wiring more than returned when you sell the home, because home buyers have started showing their technical savvy. Homes wired for video and networking can have a higher resale value, especially those with high-speed Internet access. Structured wiring" is a concept that anticipates the electronic needs of every room in your house, today and into the future. Think of a structured wiring system as an electronic foundation for your house. 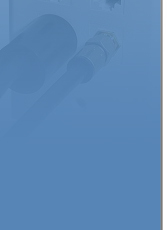 This foundation will support your telephone, fax, modem, cable TV, satellite TV, and high-speed Internet needs. You can link your TVs so everyone in the house can watch the same show from a single DVD player. The computers in your house can share files, or share a common printer. You can access the Internet in every room of your house. You can easily build a home office with separate phone lines for voice, fax, modem and computer networking, with additional lines for cable and satellite reception. The concept of a structured approach to wiring has been used for years in office settings, but it's quickly becoming an essential component of the modern home. You can build a structured home wiring system gradually and incrementally, as your needs and budget allow, but you have to plan ahead. You have to start work on that electronic foundation early. The wiring itself should be installed before you fill your wall cavities with insulation and cover them with drywall. Once the wiring is in place, you can develop your system at whatever pace suits your needs. Text and images are copyright © Creative Data Wiring and may not be used without permission.